Welding gases are incredibly useful tools for getting the job done, but they can also be incredibly dangerous if not handled properly. Here are five safety musts to keep in mind when using welding gases. Protect The Cylinders. Cylinders are strong, but not indestructible. The biggest concerns are physical damage, excess heat, and tampering. Keep them away from combustible or flammable materials and always store them upright. Always lift or roll cylinders to move them; don’t drag them. 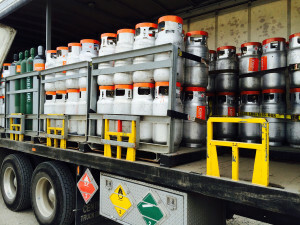 If cylinders must be transported by vehicle, tie them down to limit movement and bouncing. Maintain Hoses And Connections. It’s not just the cylinder you need to worry about. The hoses and connections are actually more likely to fail than the cylinder itself, leading to costly and possible dangerous leaks. You should check connections before and after every use. Look for cracks, punctures, or areas where the connection is not tight or is pulling away. Make sure the valve is closed every time you move a cylinder. Use the protective caps and regulators provided and keep them in place. Ensure Adequate Ventilation. Keep the air flowing when welding in closed areas; you don’t want to breathe fumes or the gases caused by the arc. Use natural drafts to your advantage or if none are available, position fans or the welder in such a way that the fumes are kept from his/her face. Ventilation is of the most concern in confined areas and needs will vary depending on what is being cut and the gases being used. Make Sure Equipment Is Clean And Uncontaminated. It should go without saying that you want to use clean, uncontaminated equipment that is in good condition. Not only will this ensure a better, purer weld, equipment that is contaminated can be a safety hazard. Fumes and gases that are used or formed during the weld could mingle with the contaminant and create a hazard. Use Personal Safety Protective Gear. Many welding gases or the gases the arc produces should not be inhaled or allowed to get near the eyes. Arc rays can spatter and emit UV radiation, which can be extremely hot and burn skin on contact. Personal protective equipment like gloves and safety glasses are a must. Ear protection, long sleeves and pants, and closed-toed shoes are also recommended. Another way to protect yourself and your employees is to always read and have available the Material Safety Data Sheets (MSDS) for the welding gases you use. These sheets provide valuable information, including safe use and handling practices. 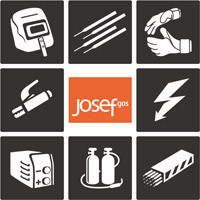 To learn more about welding gases or order a supply, contact Josef Gas at 416.658.1212.